This coming February, ANCOP Regina led by ANCOP Regina Coordinators, Gregg and Chelo Ravasco will be leading a delegation composed of parishioners of Holy Child, including their parish priest, Fr Dan and CFC members in a week long Immersion in ANCOP Saskatchewan Village in Tabako, Albay. This trip is part of ANCOP Canada’s unique programs to share the joy of sponsors and potential donors with ANCOP home partners. Annually, at least 8 delegations – students, parishioners, CFCYouth/Singles for Christ members and CFC families go to the Philippines to build houses, build relationship and immerse themselves in ANCOP Villages. Some also do a one-day meet up with their child scholars or do teach in programs in ANCOP Canada villages. This exposure trip is also undertaken by two (2) high school teams : one from Vancouver and another from Toronto. High school students build leadership qualities and oftentimes result in appreciation of one’s blessings after their 2-week long stay. 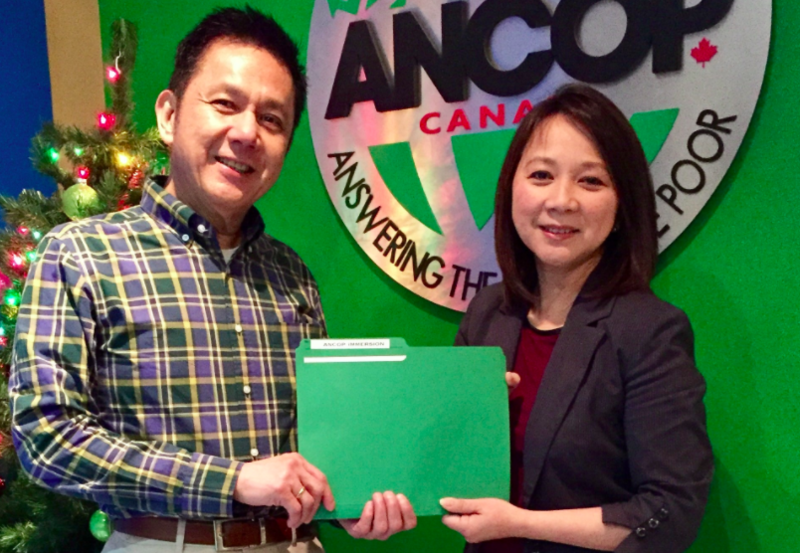 Today at the CFC and ANCOP offices in Toronto, ANCOP Canada president Ricky Cuenca and ANCOP Canada Regina coordinator Chelo Ravasco inked the Memorandum of Agreement to kick start the Immersion program for their delegation. ANCOP Regina is the second delegation scheduled to visit the Philippines in 2018. Toronto Catholic District School Board will be embarking on their 7th Philippine Service program visit this December 28 til January 10. If your family, parish and professional organizations are interested, email info[at]ancopcanada[dot]org.